Best seasoned wood block for foundation making. 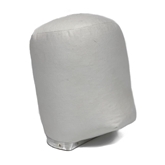 Our Canvas covered head blocks are designated for styling and storing wigs. They are constructed of three layers of foam, have a natural head shaape and top quality finishing with canvas material. This makes them strong,but only 734g in weight. Lightweight,strong and portable this stand is idea for those who need to travel. The stand has a height adjustment from 90cm to 178cm and weighs only 2.10kg. Comes in a handy travel bag. Fits all sizes of training haed and wig blocks.